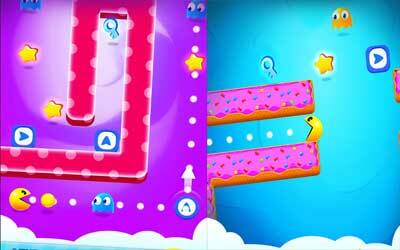 PAC-MAN Bounce APK 2.1 is inspired by classic Pac Man game. It is available under puzzle category. In-app purchases feature is utilized in this puzzle game. You might need to pay with real money to enjoy certain feature or privilege on the game. BANDAI NAMCO Entertainment Europe is the developer that releases this fun game. If you play it, you will be part of 5 million users who already download it. Playing this game is recommended to spend your leisure time. With its colorful graphic, Pac Man world will ready to cheerful your day. As it goes with classic Pac Man, in this game you will play as distinctive round and yellow face roaming around the map. It also incorporates complicated maze and puzzle gameplay as well. The ghost from original game can also be found in this game. Instead of running on dark maze, a maze made out of tasty snack. In order to win the game, you need to dodge ghosts of the map. Once you are completing certain level, you can go to higher level. Higher level has more complicated map and puzzle. Although the gameplay is relatively simple, each level provides exciting adventure. Users who already enjoy this game stay that it is addicting. After you complete certain task, you will get achievement. Completing achievement will give you unique rewards. It is integrated to Google Play Games. You can get automatic sign in feature and leaderboard form this feature. If you feel bored playing all by yourself, you can ask your friend to join the game. All you need to do is connect the game to Facebook. It allows you to see the progress that has been made by your entire Facebook friend. Show them how good you are in playing PAC-MAN Bounce for Android by going to the higher level. MIND-BOGGLING LEVELS! Bounce across more than 100 unique levels. DELICIOUS WORLDS! Spring your way through 10 flavorful worlds made of tasty snacks. ENEMIES TO CHEW ON! Dodge dangerous obstacles and enemies including the infamous ghost gang: Blinky, Inky, Pinky, and Clyde. FRIENDS TO OUTSMART! Compete against your Facebook friends.